Till the early 1960’s, Bhutan remained cloistered from the rest of the world. The hermit Kingdom was accessible only by foot. Of the two main entries, in the north the high mountain passes enabled the crossing only during the snow-free seasons while, in the south, the connectivity was through the plains of Assam and West Bengal. With modern development, however, came the motorable road, opening the country not just to the outside world but also overcoming the extremely difficult geography that had isolated the Bhutanese communities from each other for centuries. In 1983, Bhutan introduced its national airline, Druk Air, connecting the country to the metropolis in India, and eventually to Bangkok, Kathmandu, Dhaka and Singapore. Druk Air operates a fleet of A319 aircraft. In the latter half of 2013, a new airline was launched. Bhutan Airlines currently flies only to Bangkok but has plans to operate from several other cities in the coming year. 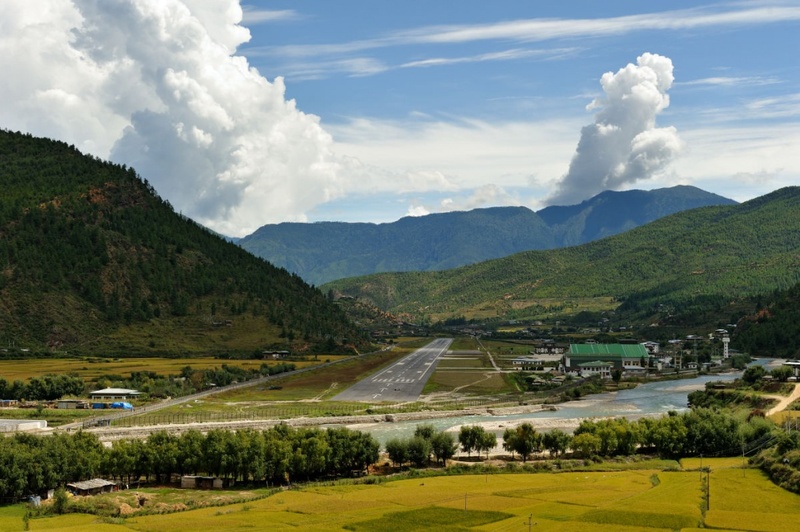 Bhutan today has one international airport at Paro in western Bhutan, an hour’s drive from the capital city, Thimphu. The international airport at Paro is located at a height of 7300 ft above sea level and surrounded by mountains as high as 16,000 feet. In the past few years, the capacity for airline travel was augmented with the opening of three domestic airports in central, east and southern Bhutan. This provides passengers with the choice of multiple entry into Bhutan from various parts of India. Phuntsholing in south-west Bhutan, Gelephu in the central and Samdrup Jongkhar in eastern Bhutan are the only land border areas open for international tourists. Phuntsholing is located approximately 170 km east of the Indian airport at Bagdogra. After Phuntsholing, the journey by road meanders northward over hills and mountains to Thimphu, the capital city. The journey takes approximately five hours. From Gelephu to Thimphu, the distance is approximately 250 kms and takes travelers through sub-tropical regions before entering the alpine zone and then finally into Thimphu. The journey traverses across three districts in about 10 hours. Samdrup Jongkhar, the only entry point in eastern Bhutan, borders the Indian district of Darranga, Assam, and is approximately 150 kms away from Guwahati, the capital city of Assam. The journey from Guwahati to Samdrup Jongkhar takes about three hours, and thereafter an additional six hours to Trashigang, Bhutan’s largest district. From Trashigang, the lateral highway takes the travelers via Mongar, Bumthang, Trongsa, Wangde Phodrang and then finally to Thimphu. The distance of about 700 kms takes a minimum of two days.